Revetments | Abbotts' Construction Services, Inc.
Coastal erosion affects many parts of the United States but the effects are more pronounced in southeastern regions such as Florida where coastlines can recede by up to 25 feet year-on-year according to the U.S. Climate Resilience Toolkit. Engineering techniques such as building revetments and seawalls have their own downsides, but they can be effective in protecting homes and businesses against the potentially devastating impact of waterfront erosion. If you have heard about revetments and want to learn more about this method of erosion mitigation, here is a quick guide. 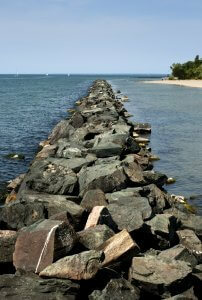 Revetments are concrete structures made by organizing stones on a prepared slope. The barrier absorbs wave energy and minimizes beach or lakeshore corrosion. The irregular surface of the revetment is especially important in absorbing wave energy and reducing the effects of wave rebound. The slope allows rebounding waves to run up the concrete structure and therefore lose their energy. This not only minimizes corrosion but also preserves the integrity of the erosion control structure for longer. Revetments and seawalls bear some similarities. Both structures work to mitigate erosion along coastal and lake shorelines and riverbanks. A key difference is that revetments have a slope, and seawalls are often designed upright. Revetments usually have a rough or rippled surface, while the surface of seawalls is typically smooth. Another difference is that a seawall usually covers the entire area between the mainland and the shoreline, while revetments only run up to a certain height. Some hard engineering methods are more effective than others are in controlling beach erosion. Extremely solid structures such as seawalls, bulkheads, and tidal barriers tend to increase the energy of oncoming waves. Instead of absorbing energy, these solid structures redirect the waves. This backwash effect, in fact, scours and undercuts the toe of the erosion control structure, resulting in the structure tilting toward the lake or sea. While in such a position, the solid structure will not adequately protect your beach. On the contrary, a revetment is a hard engineering solution for controlling beach erosion. Instead of deflecting wave energy, the stone arrangement absorbs wave energy and prevents the effects of wave backwash. Revetments may, therefore, have a comparably longer service life. Compared to seawalls, which tend to be huge concrete structures, revetment stone structures are less expensive to construct and have fewer maintenance requirements. Nonetheless, ongoing maintenance can increase the service life of any erosion control structure. The cost of a revetment will largely depend on factors such as the quantity and cost of material, mileage costs, labor expenses, and the type of equipment used for construction. Although revetments can be very effective in thwarting beach erosion, these structures have a few downsides. Many people are concerned that revetment stones lack aesthetic appeal. However, over time, waves carry and deposit materials onto the stones, therefore helping to conceal the lower part of the revetment. The top part of the structure can be concealed with soil to allow plant growth. Another concern is that stone is not an effective, long-term solution for mitigating beach corrosion. This may be a valid concern where the revetment has not been properly constructed. Proper construction of revetments requires keen attention to factors such as the slope, which affects stability, stone type and size, and the use of a filter cloth to maintain the structure’s design configuration. A reputable marine construction company can provide innovative solutions to get around these two common problems. The benefits of revetments outweigh the downsides. As a hard erosion control method, revetments may also be more environmentally sustainable as the structures absorb and minimize, as opposed to deflecting, wave energy. At Abbotts’ Construction Services, Inc., we are experts in erosion control solutions in Sarasota, Florida. Call us today to find out about our revetment services to protect your lake banks and coastal shorelines.